New technology developed by a collaboration between the UA and the University of California, Los Angeles, provides real-time monitoring of streaming video to optimize network traffic. Streaming video over the Internet is the main source of network traffic congestion. Similar to motor vehicle traffic, making real-time traffic information available leads to better utilization of highways and a smoother flow. Researchers at the University of California, Los Angeles, and the University of Arizona have developed new and improved technology capable of monitoring streaming data traffic in real time and taking action before interruptions occur. The rapid growth of streaming video and the varied nature of cloud-based applications place a burden on the optical networks that form the Internet. To provide a seamless user experience, these networks must be able to sense and monitor network conditions at any given time and be able to direct traffic in a nimble fashion to avoid traffic jams and gridlocks in data transmission. This, in turn, requires fast and accurate optical performance monitoring that can keep up with the rate of data transmission. High-speed optical performance monitoring has several challenges. It requires analog-to-digital converters, or ADC, and digital processors that operate at the ultrahigh data rates of optical networks. Achieving high-speed, low-noise and low-power ADC is very difficult, and digital processors operating at such speeds are power hungry. To overcome these challenges, the collaboration of research teams led by Bahram Jalali at UCLA and Nasser Peyghambarian at the UA has developed a system achieving real-time data acquisition and processing at a record 1.2 terabits per second—about 10 times faster than currently available technology. The work was done as part of the Center for Integrated Access Network, or CIAN, an Engineering Research Center funded by the National Science Foundation. The time-stretch accelerated processor, or TiSAP for short, employs photonic time-stretch enhanced recorder, or TiSER, technology to create an optical "slow motion" to slow down the fast data so it can be digitized and processed. TiSAP consists of the time-stretch front-end, a custom-developed electronic ADC, a powerful field programmable gate array, and an integrated clock and data recovery module. TiSAP looks at the quality of the transmitted video by checking for errors in the high-speed data. If the transmission is bad or if bits are corrupted, it can move the data stream to a different channel or a different frequency and fix the problem. 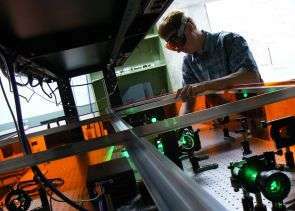 "The system takes in the data as it's coming in at high speed and slows it down while the information still is encoded in the form of laser light," explained Jalali, who holds the Northrop Grumman Endowed Opto-Electronic Chair in Electrical Engineering at UCLA's Department of Electrical Engineering. "Think of slow motion at the speed of light." The UCLA group developed TiSAP before the technology was brought over to UA to undergo testing at CIAN, to see if it would perform as expected in the context of real-world data networks. "The Internet is moving toward higher and higher bandwidth, and this is a step in that direction," said Peyghambarian, director of the ERC and professor in the UA's College of Optical Sciences. 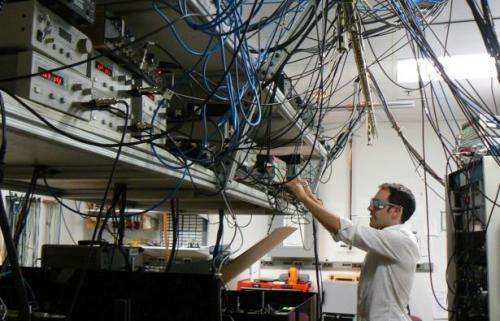 The device was tested at the CIAN Testbed for Optical Aggregation Networking located at the UA's College of Optical Sciences in collaboration with CIAN's administrative director, Daniel Kilper, and John Wissinger, both research professors of optical sciences. The collaboration included UCLA graduate students Cejo K. Lonappan, Brandon Buckley and Daniel Lam. The team demonstrated in-service optical performance monitoring of 10 gigabit per second (Gbit/s) streaming video packets transmitted through a commercial networking platform. Two Fujitsu Flashwave 9500 Optical Network Platform nodes, each having 10 Gbit/s On-Off keying modulation-based transponder line cards, were used to stream high-definition video packets. The optical network channel carrying the streaming video packets was analyzed by TiSAP to generate real-time eye diagrams of the data. "This is a very important achievement by our CIAN research team," Peyghambarian said, "as it is the first demonstration of real-time optoelectronics performance network monitoring of high-bandwidth streaming video." Real-time, in-service optical performance monitoring demonstrated here can be used to provide feedback to the software-defined networking controller to implement agile optical networks for automated network restoration, disaster recovery, efficient routing and bandwidth management.